You have a minute, right? Good, because that's all it will take to change a piece of your Windows 7. Specifically, the Start Orb. It's that windows logo button you click on to get to the Start Menu. 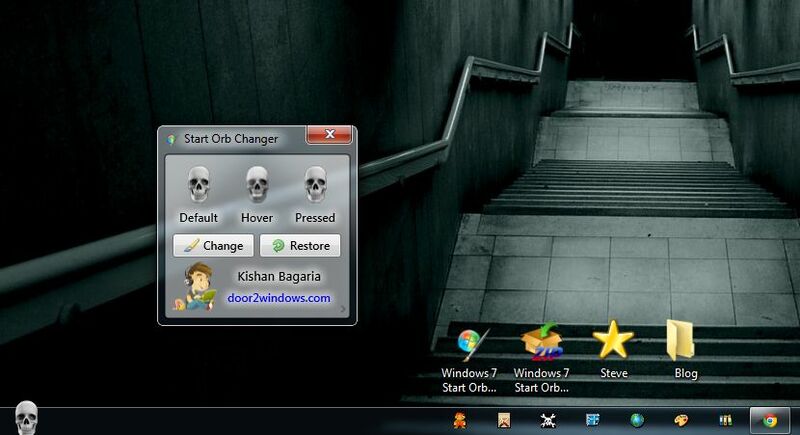 To change it, all you need is a neato piece of freeware called Windows 7 Start Button Changer, oddly enough. It's a standalone program, so there's no installation, just click. Easy right? Grab some BMPs or PNGs from deviantART. People make these buttons all the time, so the options of customization are huge. I myself use a smiling skull! After classes, take a few minutes to browse through a few pages and download a folder's worth. You'll need a selection because any time you change your wallpaper, you'll want to change that button as well, trust me. Now click the changer, select the BMP/PNG file you want to use, and click Change. Bam. Any time you want to change the button though, it's recommended to click Restore to Default first, then switch images. It's just a safer switch. No need to create a Restore Point unless you're paranoid though. Below are the sites to get the program and the images. It's that easy. Get to it! This entry was posted on October 4, 2009 at 12:14 pm, and is filed under customize, freeware, windows 7 . Follow any responses to this post through RSS. You can leave a response, or trackback from your own site. pretty nifty, looks easy too. @Buc Yup, probably gonna be sub-par for a lil bit. Working on making articles at the moment. Ease of access comes as second priority.